Darrington Mountain Bike Skills Area is Open! Not familiar with the Darrington Project? Click here! From our partners at DNR: DNR is opening 4.5 miles of new mountain bike trail, with more trail to come, in our new North Mountain Bike Skills Area an hour's drive of Everett. The new trails just outside of Darrington provide opportunities for family friendly, skill-building riding across a variety of loop and other trail options. skill-building riding across a variety of loop and other trail options. This portion of the future trail system has been designed to provide year-round enjoyment. July coming up fast that means one thing—the Annual Evergreen Education DH CLINIC! Are you looking to dial in your descent skills on technical terrain, or get the skills to break into DH racing? This is the class for you! You Gave. USFS Approved. We Break Ground! You continue to blow us away with your incredible support for Washington Trails—and the future riders of Alpine Baldy thank all of you who GaveBig! Last May we asked to you make history—to contribute to a fully self-funded project to build an extension to our Alpine Baldy Trail and turn it from and out-and-back into a loop trail. And now, thanks to you, we’re breaking ground this month! Just outside Leavenworth, WA you’ll find Rosy Boa—a trail off of equally-popular Freund Canyon. Boasting gorgeous views of Leavenworth, Rosy Boa promises riders twisting berms, jumps, and a knife edge ridge (for the bold) on this central Washington classic. 8th Annual Evergreen Mountain Bike Festival; Record Demos and Sold-Out Spaces! More bikes, more fun, and more activities than ever before—if you joined us at the 2017 Evergreen Mountain Bike Festival this year, you know what we’re talking about! Early-morning drizzle couldn’t keep the crowds away as over 3,000+ riders, families, and first-time Duthie visitors showed up to demo the largest number of bike fleets yet—and set records while doing it! Mornings are hard—but coffee, donuts, and early demo access makes them easier! On Sunday, Team Epic members took advantage of early access to the hundreds of demo bikes at the 2017 Evergreen Mountain Bike Festival—a good opportunity too, since most demo fleet vendors reported breaking their North America demo numbers at the festival! Team Epic members joined Board Secretary Peter Sherill and the rest of the Evergreen staff to take a few demo laps before the 9am Festival opening. On June 1, several Team Epic members joined staff for an exclusive tour/feedback ride on sections of the new Raging River trail system (another preview is scheduled for later in June). While the system currently remains closed as trail builders work to meet the project grand opening this summer trail staff invited Team Epic members to get a sneak peek and provide feedback on the trail’s new features. This Weekend: 8th Annual Evergreen Mountain Bike Festival! Get stoked! 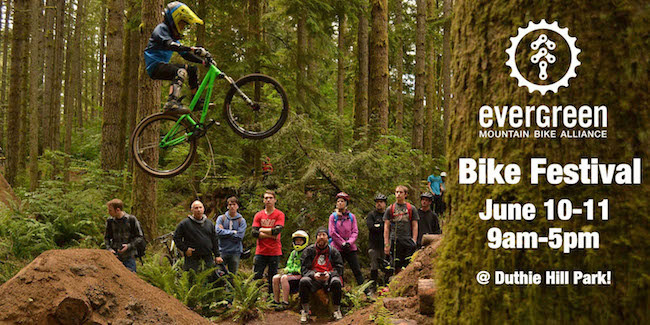 The 8th Annual Evergreen Mountain Bike Festival is THIS weekend—Saturday and Sunday (9am-5pm)! Maps? Check. Food and Drink? Check. (Slide Thru and Green Tree)! Skills rides and demos? Check. You and your riding buddies? Question mark..? The Evergreen Bike Festival at Duthie Hill in Issaquah, WA is less than a week away and we're excited to have you join us for this epic 2-day event!